CurrentCost app … take 2! I’ve been talking about it for a while, but I finally got around to spending some time working on a CurrentCost app. 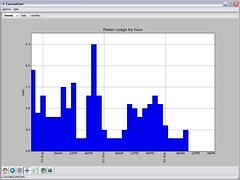 The original code was written in C# using .NET 3.5, and I used WPF (Windows Presentation Foundation) to draw the graphs. For a number of reasons this proved unpopular and I got a ton of emails saying how this was no good for them. So I decided to start again. 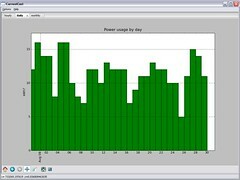 The new app is written in Python – using wxPython and matplotlib to create the graphs. Using py2exe, I’ve been able to compile the whole thing (combining my script with a Python interpreter and a copy of all of the third-party libraries I’ve used) into a Windows executable that will (hopefully!) run on any Windows computer, without needing installing or requiring any pre-requisites. I can also make the Python script itself available, making it something that Linux users could run as well. This means I get the low-overhead Windows experience I wanted, together with the ability to make it cross-platform. Neat! I’ve been able to produce some more interactive graphs – the graphs in the new app can be zoomed in and out, panned, moved around, printed, and exported to images. As the amount of data in the app builds up, I can see this becoming very useful. My last two Windows Mobile phones have both had GPS, so I’ve played with code to get my location from the GPS a few times. These have generally been quick hacked-together bits and pieces. In all of them, I wrote my own GPS code. I knew that the GPS device would be accessible through a serial port, so I just connected to the relevant COM port and started reading. It’s easy to parse – NMEA sentences are written with an update on each line, in comma-separated strings. After sharing my OpenCellId client last week, I was encouraged to try rewriting the GPS code for it using the Windows Mobile GPS Intermediate Driver. So I had a quick try. I was vaguely aware of it before, but hadn’t taken a proper look. In this post, I’ll describe briefly what it is, it’s benefits over home-grown hacks such as my own, and share a couple of things that I had to do to get it to work. Solent Youth Action started life as the Eastleigh Millennium Volunteers (MV) project. The charity was started as the result of identifying limitations with that project, and expanding on it with complimentary projects which, over time, became larger than the MV work itself. But that heritage does show through in our aims and objectives which talk about “empowering young people to develop as individuals … through volunteering whilst making a positive contribution to the community”. We are first and foremost a youth volunteering organisation. The last year or so have been very successful for SYA, and with v funding secured for the next three years, the immediate future looks good. But what happens next? How should we continue to grow and develop? One approach that we’ve been discussing this week is whether we should moving beyond purely volunteering. We already have a number of objectives in trying to help the young people that we work with: around their personal development. This can be emotional development, it can be skills development, it can be educational, it can be career-focused… with an underlying theme throughout of helping young people. But always, this is done through volunteering activities. What if we removed that restriction, and focused more generally on helping young people develop? I talked about this yesterday, but it’s ready for sharing now. It uses the GPS device connected to a Windows Mobile device (either internal or connected over Bluetooth) to identify exact latitude / longitude coordinates. It combines this with the cell id of the GSM tower that your phone is currently communicating with. Because if enough people do this, then we will be able to build up a picture of where each GSM cell is. Then people without GPS (either because their mobile devices don’t have GPS, or because their indoors) can work out where they are by looking up their current GSM cell in the OpenCellId database. It is great to see a revived buzz around mobile location based apps and services. There are lots of new services to try. I try loads of them, the most recent was Moot just a few days ago (I love their video which I’ve embedded here – very cute), but there are way more than I can keep up with. One problem they all share before they get to offer you their variations on useful location-based services is how to figure out where you are in the first place. GPS is an obvious response, but not everyone has it on their mobile, and even if you do, it has some big problems – it can take a while to get a fix, won’t work indoors, etc. Good solutions supplement this with other sources of information. Skyhook is getting a lot of attention at the moment for their service – mainly due to it being used in the iPhone. It means that the iPhone (and other devices using Skyhook) can work out where it is using GPS, but if a GPS fix cannot be made (or in the interim time while waiting for one) it can give an approximate location almost instantly using cell-tower triangulation and/or known WiFi access points. After my post looking back at five years at IBM, time for another reflective look back. This time: looking back at the last year’s work in Solent Youth Action. I’ve just had to write the Chair’s foreword for our Annual Report. Writing coherent English is never my strong suit, so I figure that as I spent a fair bit of time trying to write it I might as well reuse it in as many places as possible! I didn’t realise that the term has been around for a while though, until I came across an eight or nine year old bit of mobile tech history in Roo’s old office – a Psion Netbook. 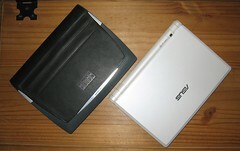 I’ve had a couple of Psions before (a Siena and a Series 5), but I’d never heard of the Netbook before. It’s a similar size to my EEE PC, although a little heavier. It has a decent-sized keyboard, a 7.7″ 640×480 colour backlit screen, Opera 3.62 (with support for HTML 3.2), a Java 1.1.8 runtime, and a bunch of PIM-type apps. No bluetooth or WiFi, but it does have RS232 and infrared.